Keep the kids busy with lots of puzzles on a dog theme. We've mazes, dot to dots, word puzzles and more. Featuring only the numbers 1 to 10 but two cute pictures our cat and dog dot to dot is a perfect introduction to dot to dots for very young children. Our cute corgi has a friend with some pieces missing! Can the kids help copy them back in...? You need to look closely at the completed picture to help you fill in the missing lines on our complete the dog puzzle. See if the kids can copy this cute picture of the Queen's favourite type of pooch, a corgi! Careful drawing and concentration required! Boggler puzzles are great fun for kids of any age! See how many words they can find in this dog boggler puzzle - there are extra points available for doggy-themed words! Do you know your dachshunds from your dalmations? This word search has 15 dog breeds hidden in the grid - can you find them all? We've included the solution if you get stuck. We've broken up the names of some well-known dog breeds into three blocks of letters and scattered the blocks across the three bones on the puzzle. Can you put them back together again? Three sheepdog dot to dot puzzles, featuring numbers 1-25 and alphabet, lower case and upper case. 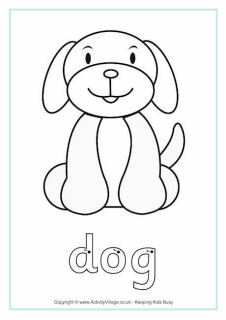 The simple bold lines on our second dog dot to dot will appeal to young children. Choose from numbers 1-25 or upper case or lower case alphabet versions. The kids will love this cute dog match up puzzle - can they match up the pairs of dogs to find the odd one out? This poor dog has lost his bone! Can the kids help him through the maze to find it? Can the children help this cute dog find his bone? This is one of our more challenging mazes, and we've included the solution if you need it. Woof woof! Can the kids find all the words related to dogs that are hidden in the word search grid? There are 12 to find in total! How many smaller words can you make using the letters in the phrase "puppies are cute"? Quite a few I expect! Write your words on the bones below. Can you help the puppy find his kennel through the maze? This is great for little children who love animals. You can colour it in when you've finished too. Can you make this same dog shape, using the tangram pattern pieces you have cut out? Younger children can place their shapes on the print-out to make it easier.